New version, I tried a few new tricks, got the sss to work as I wanted it to work. i.dyoel - Nice! It would be great if you could work on the contact between the candle holders and the table, though, with slightly darker shadows from the metal holders and much darker shadows from the glass plate, and enough bounce light on the bottom of the metal holders that they blend into the shadow area. Sir Jeremy, Thanks for the comment. Here’s my 2nd attempt. straight from max, unsharp mask only in photoshop. No GI. I’ll try turning on GI on my next render. 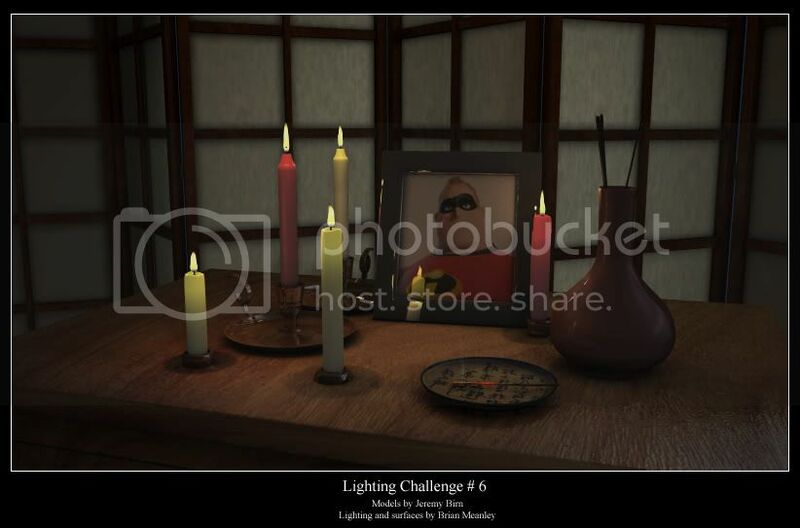 @Triker, I like the texturing of the candles! @ACamacho, I like the illustrative quality! @MLoDY477, I really like the atmosphere your work, the worn book, the smoke, the spiderwebs, great! I have started on mine, using the tutorial by Pete Draper for guidance. I’m going to do more with the materials in the rest of the scene and provide a little more illumination. I like the candle material, but something must be amis with the falloff map I’m using for the candle flames. Here is my version 3, did some noticeable changes to it, mainly the picture frame and some subtle changes with the lighting. I did some minor post work just cuz, but I tried to focus the image more towards the candles on this pass. I had trouble with getting the candles to show up on the ZDepth map, so I couldn’t do what I initially wanted, which was to bring the focus towards the front of the table, o well… here’s the image. great job everyone, some of these are really coming along quite nicely. I finally got a few hours to play around with the scene a little bit, this is what I have come up with so far. This just consists of straight lighting, point lights with falloff for the candles, and shadowmapped spots for the fill lights. No FG or GI of any type. Don’t know how much more time I will get to mess with it, but any comments/critiques are more than welcome. Thanks, and again, great job! Hi, I’m just discovering your works, it’s great ! Jeremy have always got excellent ideas. Candle is a classic, but very complex. Rendered with finalRender. Added DoF, grain and (tiny) touchups in Photoshop. How do you post the full image here? Hi everyone, it’s my first participation in this contest and here it’s my render, I called “it’s, time to go”. I’m right with ya Thykka. I’m trying SSS on the candles, to see how much better it would look, but Mental Ray is giving me some nasty artifacts on the candles. I tried increasing the lightmap size [up to 4000x4000] and that didn’t seem to change anything. I also played with the radius and weight a bit and it was still the same thing. I also tried changing my raytrace shadow’s radius back to 0 and that didn’t help either. Here is a comparison of what it looks like, left side is with SSS, right side is my translucent blinn. LiquidStorm3D, I got a similar effect when my back scattering was too high. You may want to try lowering it. Also, increase the samples rather than the size of the lightmap. By default I seem to remember it is set to 64, try up to 256. I think I might just stick with my non-advanced system, lol. I was looking forward to using FG+GI and the SSS on this scene. Unfortunately, I was unable to troubleshoot that artifact problem with the SSS shader, so I went back to the blinn and adjusted some things to try and match what I was expecting to see with the other shader. Here is my version 4, which now includes FG and GI. I also added an HDR image to add to the reflections and overall ambience of the scene. There is a weird color issue on the picture in the frame, not sure how that got there since Caustics was turned off, but I think it adds to the image. I’m not satisfied with the candles, but it’ll do until I can get subsurface working right. jucaduarte - Welcome! That’s a nice image! I wonder if that shadow of the person could be more subtle? Right now it seems very dark in places, especially on one of the candles it makes it go black. The flames look like they need work. Having a gradient on them is a good idea, but the whole flame should be a bright, glowing area, not like a solid surface with stripes on it. Thykka - Nice job! Overall that scene makes a nice impression, things you’ve done in post are subtle enough that they work for me. The SSS is OK, if you could turn it down so it was more subtle that would be better. The plate could use a shadow or reflection or something to better connect it with the scene. meanlebh - Nice scene! Hey, I know that guy! The reflection of the candle on his chest looks kindof like an Incredibles 2 logo… That’s a well balanced scene, and even the fact that the shot is framed kindof wide doesn’t bother me, it gives everything some room to breathe. The circles under each candle wouldn’t be so pronounced if the shadows from the flames were as soft as they would be in real life. M31 - That’s a good start! It would be great if you could soften your shadows. i.dyoel - Nice image! Overall the tones in your scene are working well. The whole scene complements the framed picture nicely. There’s a very hard-edged shadow being cast onto the picture frame and a few other places that should be toned down or made softer. And the smoke needs work, it looks like it brightens everything seen through it. Diabolos - Welcome! That’s a nice scene, I like the goth look! To post full images instead of attachements you need to have some webspace where you can upload the images, then include the URL of the image in the [img] tag. Attaching an image like you did works fine though. The shadows and occlusion in your scene could be improved, if you look at the base of a candle holder touching the table, try to get it looking as if they are definately in contact. leovinci - Nice scene! I like the subtle shadow from the character behind the screen! About the SSS issue, to be honest I am not sure how to fix that specific problem. I did get that artifact however and I just ended up using a the “misss_lightmap_write” instead of the “misss_fast” one. Just connected the mentalrayTexture to the lightmap portion in that shader and the miss_simple_phen to the lightmap sample. That fixed my noise problem but I know some of the MR gurus here will scoff at this method.